Singapore – Digital creative agency noisycrayons has deployed a digital engagement programme for Kleenex Tissues, a global icon for disposable paper handkerchiefs and wipes. The initiative takes the perspective of Singaporeans who want the best for their family and therefore strives to make a difference to their lives, whether they’re at home or out and about. Engagement activities revolving around the theme of ‘happy and comforting moments in life’ rally young Singaporean adults to share stories of how they create great experiences for their family on social media. We know that every day can bring a jumble of sniffles, spills, and sticky fingers, so the campaign amplifies the message that whenever a need arises, you could reach for a Kleenex, clear up the situation and uncover a cheery surprise! To demonstrate how Singaporeans can show comfort and affection to their loved ones, the audience is invited to pass on the Kleenex cheer to their loved ones so that they could receive a real perk too. 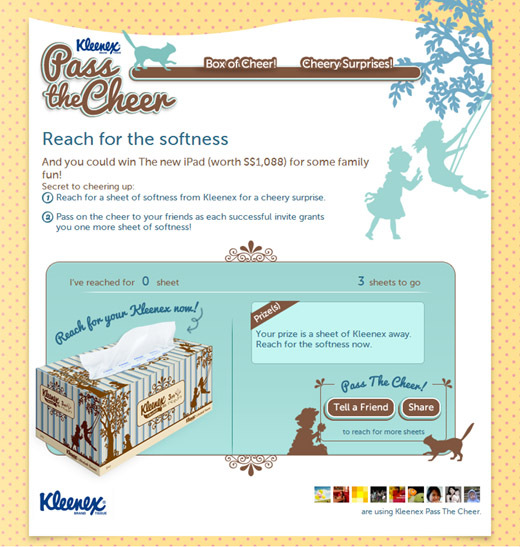 The Kleenex cheer is passed on to hundreds of Singaporean families who would receive hand-delivered product hampers! This is Kleenex’s way of saying that the trusted brand has been a family’s go-to for softness and comfort since 1924! The programme leverages on the intensely social nature of digital platforms such as Facebook to help young Singaporean adults feel a sense of kinship and closeness with each other. The initiative is expected to reach more than 2 million young adults in Singapore.